As well as the town council and the Douch Family Funeral Directors in Ferndown, AE Joliffe and Son, the Ferndown RBL Club, Dudsbury Golf Club, Colten Care’s Fernhill Dementia Home and Rotary Club of Parley have all helped raise the amount required. Emma Regan, from Douch Family Funeral Directors in Dorset, said: “This is an important community project which we are proud to be involved with. “Many of our staff have had ‘dementia friendly’ training and understand how important things like this can be for those with dementia. “The RBL Club, Dudsbury Golf Club and Rotary Club of Parley have all come together with other volunteers to make it a reality. “The allotment will be a fine addition to the town’s facilities and as well as helping those living with dementia will hopefully produce some lovely vegetables. “There will be a grand opening with dignitaries and volunteers attending. “The steering committee is looking forward to having a number of different types gardening clubs set up at the allotment. 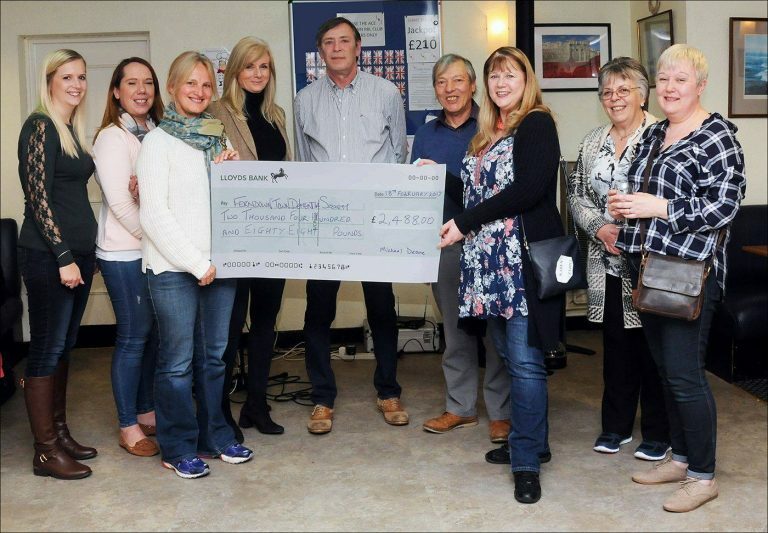 Pic caption: Just one cheque for the Ferndown Dementia Sterering Committee to put to good use (l-r) – Victoria Coe, Sam Atkins, Gina Smith, Lisa Sanders, Michael Deane, Harry Worth, Karen Grant-A’Court, Jackie Dunning, Kate Morris. Learn more about our community investment initiatives or our funeral services in Dorset by calling your local branch.